So, I'm back again with another review of a great skin care product. Valentia has come out with a serum for your face that is not only going to make your skin hydrated and soft, but by using all natural ingredients, your skin is going to be brighter, healthier, and younger looking. Valentia Clear Lift Revitalizing Serum is a lightweight serum that will renew texture and tone, deeply moisturize, minimize fine lines, increase elasticity, brighten and plump fine lines, and even hyperpigmentation (dark spots). The list of natural ingredients in this small jar is too good. Organic and vegan-friendly ingredients, such as seaweed, gotu kola, lactic acid, licorice, and argan oil are all selected to work together to achieve optimum results for your skin. Once I put this serum on my face, I could instantly feel a difference in texture and freshness, with a nice lemony scent. I have always struggled with dark spots, especially since having children, and I'm excited to see if after using this serum, my dark spots start to fade. Also, I'm always looking for new treatments to dry skin. So far, after using this product for a week, my skin feels smoother and smells wonderful. 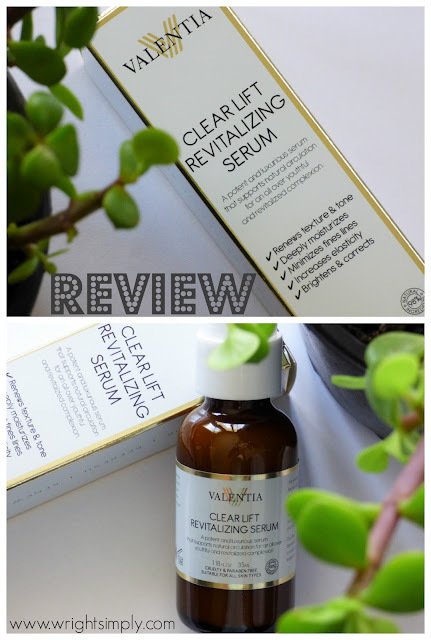 I'd love to know if you've tried Valentia Clear Lift Revitalizing Serum yet and how you liked it? If you haven't had the chance, now's the time, as you can find it on Amazon or at Valentia. And have you had a chance to try Valentia's other products yet?? What are some of your favorite must have beauty products? Here are some of my favorites!! Love lifting serums and eye creams, I haven't tried this brand, as I opt for more natural, chemical-free options, do you know a lot about the percentage of natural ingredients here? I hadn't heard of it before. I always feel so behind on beauty products. I might have to try it out! We love their products over at the Dollhouse. Their masks are the best. I've been on the lookout for anti-aging products. I feel like this serum would be a great add to my beauty regime. This product looks great. I have to try it. I've never heard of this! I need to start getting better about skin care though. Now that I'm in my 30s a little moisturizer won't do the trick! It seems like Valentia is taking over the blog scene lately and everyone is loving their products, I definitely need to give them a try!